If you're anything like me, you're already looking ahead to summer vacation possibilities for 2012. And, well, I may have just found mine. Guitarist Paul Gilbert has announced the first annual Paul Gilbert's Great Guitar Escape, set for July 9-13 at Full Moon Resort in Big Indian, NY. The week-long workshop, which will focus on the techniques, styles, and life of the modern working musician, is open to guitarists of all ages, levels, and styles. "The concentrated guitar-power that I have assembled for The Great Guitar Escape could light a city the size of San Antonio for the next 1,000 years," says Gilbert. "But more importantly, the workshops, nightly concert jams, and interaction with the pro musicians and fellow music lovers will give you inspiration and memories to last a lifetime. If you are a guitarist, bassist, drummer, or thinking about becoming one, don't miss this amazing camp!" Featured instructors at Paul Gilbert's Great Guitar Escape include guitar virtuosos Guthrie Govan, Tony MacAlpine, Chris "Kid" Andersen, Scotty Johnson, and Sam Coulson. Other distinguished guest musicians include bassist Kelly Lemieux and drummer Rodney Holmes as well as engineer/producer Tom Size (Sammy Hagar, Aerosmith, David Lee Roth, Huey Lewis, Eddie Money, Mr. Big, Y&T, Europe, Steve Miller Band, Joe Satriani, Ella Fitzgerald, Joe Pass). In addition to his daily Rock Master Classes at the Great Guitar Escape, Paul has set aside additional classes specifically to help beginning guitarists get on the right track for technique and practicing. These classes—personally taught by Paul—will focus on helping guitarists become comfortable with making music in minutes. "I took my first guitar lessons when I was six years old," Gilbert recalls. "My teacher taught me 'by the book,' and I ended up quitting from boredom and frustration. It was years before I finally started again. I wish I could go back in time and teach myself the basics of how to play the guitar. It would have put me years ahead at such an important time of my life. If guitar is taught the right way, it can be surprisingly easy. No boring exercises. Just music! I'm excited to give you the start that I wish I'd been given." Paul Gilbert's Great Guitar Escape packages start at just $999. For full details about Paul Gilbert's Great Guitar Escape, visit: www.greatguitarescape.com. When Apple first launched the iPad, my first thought was that it would be a great tool for sheet music. Not surprisingly, so did the folks at Hal Leonard. After more than a year in development, the venerable sheet music publisher has unveiled the world's first cloud-based iPad app for sheet music. 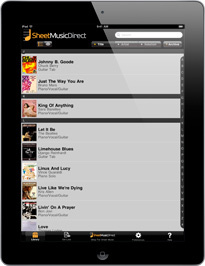 Sheet Music Direct for iPad was created by musicians, for musicians, which is abundantly evident in the app's amazing feature set. Upon downloading an interactive song, users can transpose and mix the songs to meet their needs, hear the score playback as well as optional click tracks, and create customized set lists to keep their music organized for gigs. The app also includes a tuner and metronome, and it's compatible with Bluetooth hands-free page-turning devices. The library offers both list and browse viewing modes; sorting by title, artist, or notation; an archive option; set lists; and custom music viewer paper types and backgrounds. The music viewer has a zoom function, one-touch page number navigation, and popular social media sharing options, among other cool features. Because the Sheet Music Direct for iPad app is fully mobile, you can purchase sheet music within the app while you're on the gig! 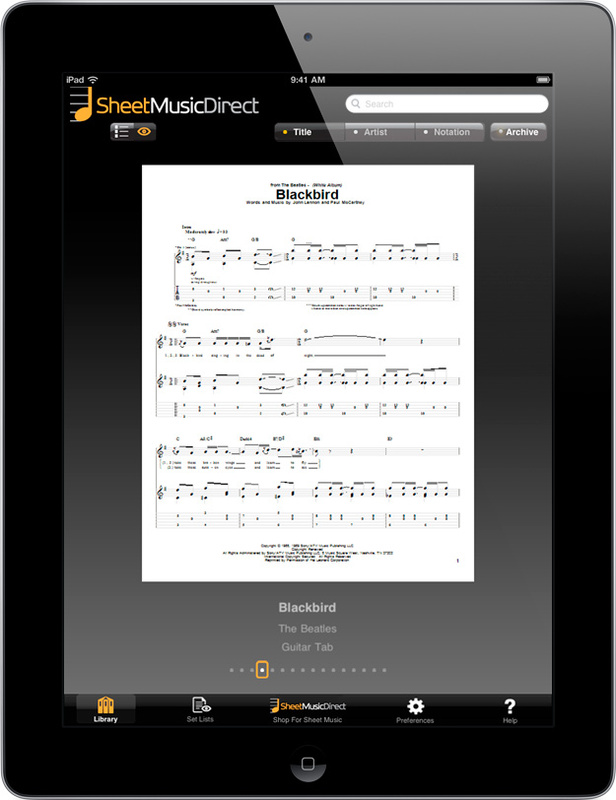 Using the cloud service, you can view and sync all of your purchased sheet music from your iPad and computer. All in-app purchases will automatically be backed up on the SheetMusicDirect.us web site. Sheet Music Direct for iPad comes with 15 free pre-loaded songs, including "Time Is on My Side," "House of the Rising Sun," and "Scarborough Fair," to get you started. For more info, please visit sheetmusicdirect.us/ipad. 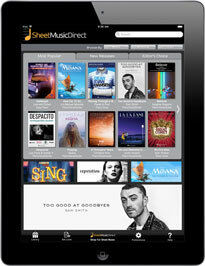 To purchase Sheet Music Direct for iPad, visit the App Store. One of the most exciting elements of rock is undoubtedly the guitar solo. So what happens when a band has two fret-burners doling out the riffage? Guitar bliss! Here are our 10 favorite rock guitar twosomes of all time. Click on the highlighted names for video lessons, guitar tab, and more! Admit it: the first time you heard this Teutonic twosome, it was love at first string. Look no further than the harmonized intro to "Bringin' on the Heartbreak" to hear why Def Lep's dynamic duos rank among the all time greats. Although the Dublin-based rockers' guitar spots have seen more turns than a revolving door at Macy's, it was Gorham and Robertson occupying stage left and stage right for classics like "The Boys Are Back in Town." It's a shame they'll always be the "replacements," because Haynes and Trucks compose one of the most dynamic guitar duos in rock history. Perry and singer Steven Tyler may be the "Toxic Twins," but when the lights go down, it's Perry and his quieter counterpart Whitford that fuel the band's inimitable swagger. With due respect to that skinny, old blonde dude who's also in the band right now, it's Murray and Smith's complex riffing and fiery blues-based flurries that have created the definitive Maiden sound. "Free Bird" … 'nuff said. Sure, there were other hard rock and metal bands with two guitarists prior to Judas Priest, but Tipton and Downing set the bar to which all six-string tandems still aspire. It may not seem fair for the Allman Brothers Band to be listed twice, but this is one pair of deuces that can't be beat—especially the Allman/Betts combo. For more than 35 years, the brothers Young have been the definitive lead/rhythm guitar tandem in hard rock, and they're probably the only duo on this list for which replacement is just not an option. 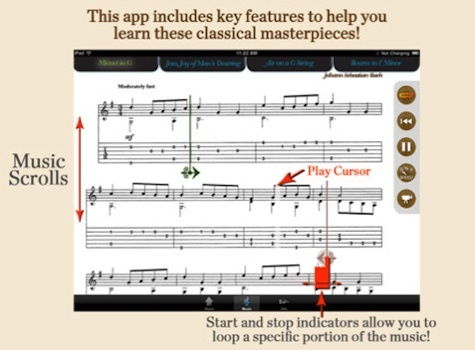 With video instruction taught by former Musicians Institute instructor Danny Gill, the app also features high-quality audio (not MIDI), standard notation and tablature with animation, the ability to slow down each piece to either 3/4 or 1/2 speed, and a looping function. 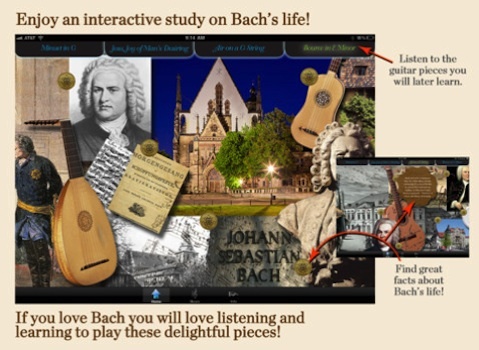 In addition to the musical instruction, the app offers an interactive look at the history of Bach's life and his contributions to music, with help from the Bach Museum in Leipzig, Germany. The app is all-inclusive—no wifi streaming is required. 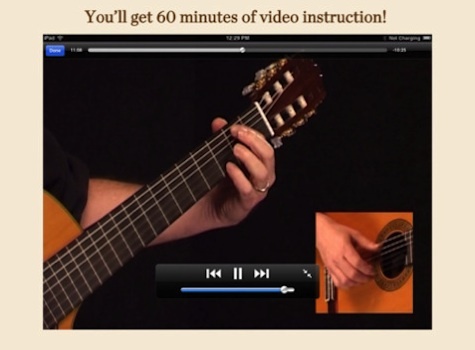 Visit the App Store for more information and to purchase Classical Guitar: Bach. Woke up this morning, fresh off my turkey tryptophan hangover, and came across this gem of a video on YouTube. In the video, titled "Banjo Difficulties," banjo virtuoso Ben Massey of the Ohio-based Christian band the Shiloh Mountain Trio covers Paul Gilbert's terrifying instrumental "Technical Difficulties" on 5-string banjo. As you might expect, a note-for-note recital is not practical (maybe not even possible), but Massey, who is also a guitar player, serves up a stunning interpretation with a very cool surprise ending. Paul Gilbert's original is included below. Enjoy! Back in 1970, twin brothers Arthur and Albert Allen (aka The Allen Twins, or TaharQa and TundeRe Aleem), who were colleagues of and backing vocalists for Jimi Hendrix, brought Jimi a song titled "Mojo Man" and asked the guitarist to lay down some lead guitar fills. Hendrix tracked his parts, and the three friends discussed doing a side project together which would be called the Ghetto Fighters. But Jimi's sudden death a short time later put an end to that possibility. But now, over 40 years later, the track is finally going to see the light of day, as the Aleems are releasing the single on Sunday 11/27 (which would have marked Hendrix's 69th birthday), in conjunction with an animated music video the brothers have branded Clea'art (DMS). You can watch the video and hear "Mojo Man" on Sunday at urbanstreettales.com. Here's what Joel Selvin, a music columnist at the San Francisco Chronicle, had to say about "Mojo Man." "Jimi's part is not a starring role, more like a character part meant to color the scene, making the lead part shine and look a little brighter. He drops his trademark licks into the mix - an artist signing a canvas - and like the great musician he is, he knows when to stay out of the way and most important, what not to play." 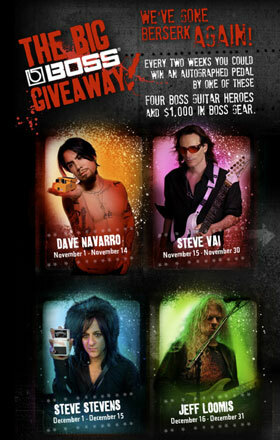 To enter, visit the BOSS Facebook Giveaway page and fill out the entry form. Contest is open to U.S. residents only. Click here for information and official rules.